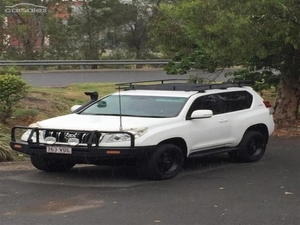 Selling because family has out grown my pride and joy of a 4WD even with all the extra space from the roof top aluminum rack, This Toyota Landcruiser Prado SUV has full service history for your peace of mind. It has king springs and bilstein shocks with 32"X 11.5" nitto terra grapplers A.T tyres 20"alloy wheels, power door mirrors, rear parking sensors and USB audio input. This car has longranger fuel tank fitted for 135 Lt tank that has been compliance plate approved, iPod connectivity and cruise control. This car is a serious 4WD for serious 4-wheel-drivers. Has icom ic-450 uhf fitted. Great when traveling with friends or getting road updates. I also have the original rims I can put back on if requested and can negotiate on price if the blacks rims are not wanted. YOU WILL LOVE THESE FEATURES This Toyota Landcruiser Prado SX SUV has rear vision / reversing camera. This car has hill ascent control (HAC), rear cup holders and map/reading lamps. Equipped with ABS brakes. It has very comfortable seating for 5. This car has 2nd row split folding seats. Multi-function steering wheel with phone & audio controls. This car has electronic brake force distribution (EBD) and multi zone climate control air conditioning.